(L-R): Gavin Gould, Sarah Landeros, Mackenzie Sise, Sabrinna Gonzales, Kendra McKinley, Brett Andrade, Victor Lumidao, Austin Castro, Beto Franco. (L-R): Alexis Gerardo, Derek Tristao. Over the last three years the DVC”s speech and debate team (also known as forensics) has become the most dominant team in northern California. This last weekend the 40+ person team won their 3rd consecutive NCFA Championship, crowning DVC the undisputed champions of NorCal. The DVC community college students defeated students from UC Berkeley, the University of the Pacific and many other universities and community colleges. Not only didDVC win overall as a team by almost double the next closest team’s score, but many individual students were named champions in their specific events. The forensics team competes in a wide range of events, each emphasizing different communication and critical thinking skills, and displayed excellence across all of them. This northern California championship is also a great opportunity for alumni to come out to support the team. Multiple alumni of the forensics team, across multiple eras of the teams illustrious history, helped serve as judges for the tournament and offer words of wisdom as the students head into competition. Below is a list of the team’s accomplishments from the NCFA Championship. Send your support to the team as they head off to State and Nationals, or consider joining the team next fall by enrolling on COMM 163 or emailing rhawkins@dvc.edu for more information. The Butte College Speech and Debate team had their first tournament of the semester this Friday at Chabot College in Hayward. Returning competitors Ashley Sutton and Patrick Mullholland took home 4 awards! Patrick took 1st in Impromptu Speaking and 3rd in After Dinner Speaking. Ashley (far right) took 2nd in Informative Speaking and was a finalist in Impromptu. New teammates Jenine Vandor (far left) and Lilliana Diego (middle) we’re able to get events tournament ready a mere two weeks into the semester, which is a major feat, and had a great first experience. We’re looking forward to several tournament travel opportunities coming up! Sac State Debate team has success on both coasts! 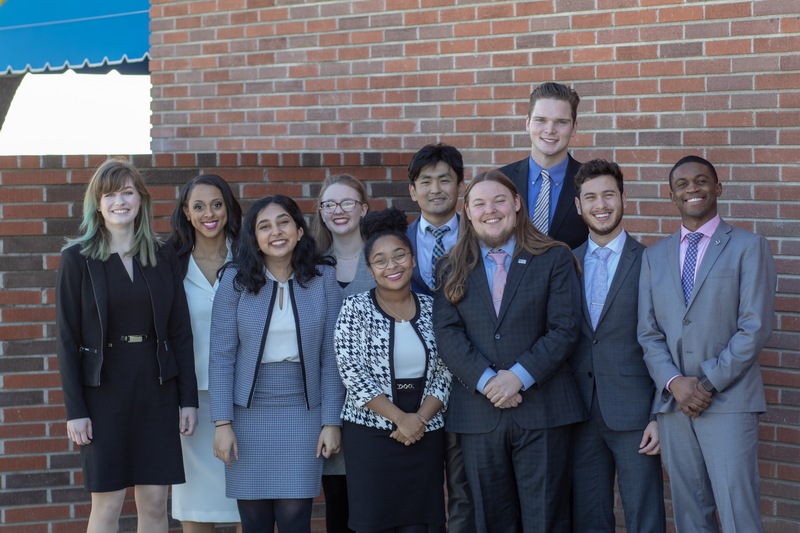 Sacramento State’s Hornet Debate Team has returned home from a long and successful weekend of debate competitions on both the East and West Coast. On Saturday, October 6th, six debaters traveled to the campus of Santa Rosa Junior College for its 50th annual Invitational debate tournament. Sac State had three students competing in the novice division and three in the varsity division. Ayyah Al-jibouri, in her first ever varsity competition, finished the preliminary rounds with an undefeated record of 4-0, racking up wins against Chabot College, City College of San Francisco, and two wins against the University of the Pacific. Ayyah advanced to the elimination rounds where she finished the tournament in the semi-final round with a close loss to the eventual tournament champion from Chabot College. In the novice division, both Zia Landis (4-0) and Avneet Uppal (3-1) finished the preliminary rounds with winning records and advanced to the elimination rounds. Zia’s undefeated record earned her a bye through the first round of elminations where Avneet won a quarter final round against Diablo Valley College. Unfortunately, due to the bracket, Avneet met Zia in the semi-finals and was eliminated. This set up a final round for Zia where she narrowly lost to Modesto Junior College, bringing home 2nd place. Meanwhile, on the east coast, four Sac State debaters competed in the varsity division at Lafayette College in Easton Pennsylvania. This is the fourth consecutive year that Sac State has traveled to this tournament and we have had students advance to the semi-finals each year. This season was a bit different. Miranda Konoplisky, in her second tournament with Sac State after transferring from Diablo Valley College, completed the six preliminary debates with a record of 4 wins and 2 losses, racking up wins against St. Anselms College, Penn State, and the host Lafayette along the way. This record earned her the 5th seed in the tournament and a bye in the first round of eliminations. In the quarter finals, Miranda defeated Capital University, avenging one of her losses in the preliminary rounds. In the semi-finals, Miranda defeated the top seed from Penn State University, setting up a final round debate against Central Michigan University. This is the first time a Sacramento State debater has advanced passed semi-finals in this tournament, and Miranda didn’t stop there. In a very tough debate, Miranda won a split decision (2-1) to take home the championship! Although the debaters compete one on one, every tournament is a team effort. The Sacramento State debate team is having tremendous success this early in the season due to cooperation and team work. We are looking forward to another great opportunity to prove ourselves at the Biggest Little City Classic on the campus of the University of Nevada, Reno in a couple of weeks. Stingers up! With three tournaments in three weekends, Pacific Forensics is off to a fast start as it finds itself 5th overall in the National Parliamentary Debate Association rankings with its top team of Senior Kayla Gerdes and Junior Dominic Lesaca ranked 8th in the National Parliamentary Tournament of Excellence rankings. These rankings cap off a strong start to the season that saw the team with multiple elimination round appearances, first place finishes in individual events, and three top 3 overall finishes as a university. First was the Northern California Forensics Association’s season opener—The Golden Gate Opener hosted by San Francisco State University from Sept. 21-23. On their way to a second overall finish in tournament sweepstakes (the 4th straight year the team has finished in the top five at the season opener), the team received contributions from both returning and new competitors. First was parliamentary debate on Friday and Saturday where 10 students (including 5 new students) competed in partnerships of 2 against schools such as UC Berkeley, St. Mary’s, and University of Nevada, Reno. Gerdes and Lesaca and transfer Junior’s Alan Fishman and Robert Torralva finished prelims with a 5-1 record while Junior Ravi Prasad and Freshman Arshita Sandhiparthi (in her first collegiate tournament ever!) finished with a 4-2 record. All three teams would make it to the quarterfinal round of the tournament. Finally, there was Lincoln Douglas Debate where Pacific debaters Fishman, Torralva, Lesaca, and Gerdes would finish in quarterfinals, quarterfinals, semi-finals, and in 2nd place. respectively, in Open division. Sophomore Connor Lemmon would be the Tournament Champion in Junior Division! Next the team would travel to Houston, Tx to compete at the Rice University Classic from Sept. 28-Sept. 30 where Gerdes and Lesaca would debate against 3 of the top 10 teams in the nation; also, Howard and Prasad would compete against some of the fiercest Individual Events competition Texas can offer. With a 4-1 record, Gerdes and Lesaca would advance to quarterfinals once again and both would find themselves as top 10 overall debaters at the tournament. Not to be outdone, Howard would place three times once again with a 1st place finish in Prose and a 1st and 2nd place finishes in Programmed Oral Interpretation. Prasad would place in Extemporaneous speaking as well. Because the veteran members of the team travelled to Houston immediately after the season opener, they would sit out the next tournament while newer members got another opportunity to showcase their abilities. Traveling to Santa Rosa Junior College Oct. 5-6, Pacific would once again use an entire team effort to take 2nd Overall in Individual Events Sweepstakes and claim Tournament Champions in University Sweepstakes. On day one, new comers Junior Marlu Reyes and Freshman Cassandra Ribeiro would advance to the quarterfinal round in Open NPDA debate at their first tournament debating together! On day two, Connor Lemmon would prove that his success at the Golden Gate Opener in Lincoln Douglas was no fluke making it to Semi-Finals in Open Lincoln Douglas debate. Finally, Cassidy Johnson would win 1st place in After Dinner Speaking and Prose interpretation, Arshita Sandhiparthi would win 1st place in Novice Impromptu Speaking as her freshman counterparts Cassandra Ribeiro and Ta’Niyia Smith would finish 3rd and 4th, respectively. Ta’Niyia would also place 5th in Poetry Interpretation. With well over 30 awards across three tournaments the team is well on its way to another strong season. We know that the rankings will change and if we do not keep working hard we will fall behind other programs. Still, it feels good to be ranked so high for now and we hope to carry our early success forward. Front row: Keishawn Robinson, Athena Rodriguez, Alessandra Filiti, Valerie Becerra, Coach Jason Hough. The Hartnell Speech Team continued its season success with several individual competitor awards at the Santa Rosa Junior College Invitational, October 6. For the second tournament in a row, Anthony Fashano led the team with a 1st place finish in Open Persuasive Speaking. His topic calls for greater legal limits to stop the practice of civil asset forfeiture: the ability for authorities to confiscate personal property of individuals simply suspected of a crime, rather than actually found guilty. Also competing for the team were Isaac Rodriguez, Victor Marquez and Victor Nambo. Assisting the team was student Athena Rodriguez. The team’s next competition will be November 2 at the Mustang Invitational, sponsored by San Joaquin Delta College in Stockton. (MODESTO, CA 9/24/18)—The Modesto Junior College Speech & Debate team ushered in the start of fall at the Golden Gate Opener tournament at San Francisco State University from September 22-23. Over two days, six MJC students competed against sixteen other colleges and universities in speech and debate events. In the end, MJC earned the fourth-place sweepstakes award. The competition was a “swing,” meaning there are two full tournaments over the course of the weekend and competitors have the chance to win in their events twice. MJC students held their own against two-year and four-year institutions, including schools from Nevada and Oregon. At the end of the weekend, MJC students collected 13 awards. The results from the first day of the tournament are as follows: In Open Informative Speaking, Kendra McKinley took third place. Alexis Gerardo was awarded fourth place and recognized as Top Novice. In Open Poetry, McKinley took home a finalist award. In Novice Persuasive speaking, Cindy Cuaraque took home third place. In Novice Prose, Jacqueline In earned first place. The results from the second day of the tournament are as follows: In Open Informative speaking, McKinley took second place. In Open Poetry, McKinley took home a finalist award. In Novice Prose, In earned a finalist award. In Novice Persuasive, Cuaraque earned a finalist award. MJC students also tested their wit and critical thinking in debate. In Novice Lincoln-Douglas debate, Daylon Hawn broke into out-rounds and debated in semi-finals, taking home an award. He was also recognized as the first place Novice speaker in Lincoln-Douglas debate. In the Junior division, Gavin Gould was recognized as the fifth-place speaker. Collectively, MJC students performed well enough that the team earned the fourth-place community college sweepstakes award. The Hartnell Speech Team kicked off its 2018/2019 season with multiple individual awards at the Golden Gate Opener Day 2 tournament held on the campus of San Francisco State University. Leading the team was newcomer Anthony Fashano with his persuasive speech concerning the practice of civil asset forfeiture by police. He earned 2nd place in the Novice Division. Front Row: Alessandra Filiti, Athena Ramirez, Michaela Miller, Valerie Becerra, Coach Daniel Lopez. Back Row: Coach Jason Hough, Victor Marquez, Isaac Rodriguez, Luke Lundin, Anthony Fashano, Victor Nambo. Not receiving an award, but recognized as the top novice in Program of Oral Interpretation, was Michaela Miller. Also competing for the team were Valerie Becerra and Victor Marquez. The team will compete next at the Santa Rosa Junior College Invitational, October 6. The forensics team traveled to San Francisco for their first competition of the year this past weekend. Patrick Mullholland (pictured far right), Kathryn Eppley (far left), and Claire McAlister (pictured center), all in their first semester on the team, did a fantastic job and competed in two events each! Day 1 results: Kathryn advanced into novice Persuasive Speaking finals, Claire advanced into finals for Impromptu Speaking and was awarded top novice for her After Dinner Speech (a speech to entertain). Day 2 results: Kathryn took 3rd place in Novice Persuasive Speaking, Claire took 3rd place in Impromptu Speaking and also advanced to final rounds of After Dinner Speaking. ADS was collapsed both days, meaning, those rounds of competition included novice and experienced speakers together. We are so proud of these three Butte College representatives and excited for our next tournament this October in Reno!